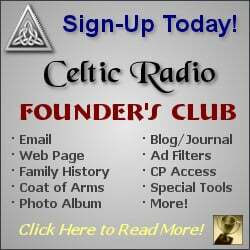 August 9, 2011 - CelticRadio.net - While our nation was born on the fields of Lexington and Concord, Irish American Folk Punk was born in San Diego. 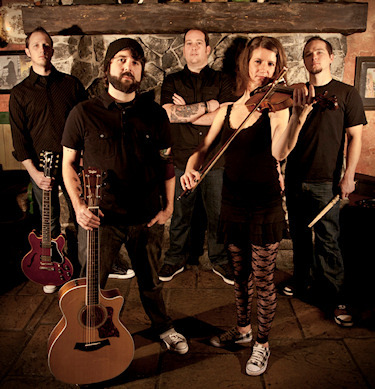 Formed in 2007, Lexington Field has played hundreds of shows and have shared the stage with the Young Dubliners, The Tossers, The Mahones, Seven Nations, VooDoo Glow Skulls, Cash'd Out and Buck-O-Nine. They also released a 5-song EP called The Streets of Dover in 2010, and just put out a brand new, all-original, full-length album titled Old Dirt Road in 2011. Their catchy, upbeat music, along with a high energy live show, is best described as a mix of Flogging Molly, Dropkick Murphys, The Ataris, Yellowcard, Great Big Sea, and Mumford & Sons. the legacy of Lexington Field, San Diegos Premier Irish Folk Punk Rock Band! They were born out of pure desire, eager to rock all of you drunk, beer-guzzling and havoc-causing misfits! They can piss off the worlds angriest leprechauns just by batting their eyes. Lexington Field will leave you wanting more, more to drink and, hell yes, more to listen to! This is Irish Folk Punk at its best!! This 5-piece band is geared specifically to move your dancing feet, raise your blood alcohol level, and leave you contemplating why you havent yet boarded a plane, moved to Ireland and got hammered at a PUB. With their first full length CD, Old Dirt Road, Celtic Punk group Lexington Field is throwing their hat in the ring with Flogging Molly and Dropkick Murphys. Although they don't tend to stand out from the established Folk Punk crowd, they certainly step in the door with some tricks up their sleeve. The CD starts off in full gear with Dukes of Green, opening with driving instrumentation and some awesome fiddle work. Unfortunately, as the song gets going, it is difficult not to get lost in the basic mood of the music and completely forget about any true merit or message the song might have. The elements of this first track seem to be pulling in their own directions with the lyrical content, and instrumentation getting lost in the overall mood of the track. The band starts to pull their act together though on The Shores of Maine, with some awesome fiddle work, and the first real jewel. The message is still hard to follow, but the song is kept on track well. Unlike the flood of the first track, this piece is a river, kept in its banks by the fiddle On Up in the sky lyrics, message, and mood finally fit as one entity to carry each other. Weathered Heart is a slower piece, where the music relaxes, and indeed that seems to be most of what this track is about. Take a breather and come back to reality refreshed. Holes in Our Hearts then dives back in to no-holds-barred Folk Punk, again holding together to take the listener on a wild ride. Here it's best to just let go and allow yourself to be carried along. Don't try to actually listen too deep, and you're in for fun. After the first three tracks, one might be tempted to put the rest of the album on as background music and not try too hard to get much out of it. However, the title track. Old Dirt Road, is one of those tracks that shines once you find it. This song is fun to listen to, and a good driving piece, and although The Toledo Tapper might be out of place if you took it completely out of context, it really shines when taken on its own merit. Lexington Field may not render the best version of All for me Grog, however, they do wonderful justice to the piece, keeping the pace smooth with clear and appropriately gritty lyrics throughout and opening the door for the rebellion in Tracy Boys Fight the World. After the battles, Laurel's Reel starts off almost out of place on the album with just sweet fiddle work. As the track progresses though, it picks up more and more, transitioning from a nice traditional sounding fiddle piece, to a full out jam session without losing its identity. The CD finishes off with A Better Place. A nice mournful, reflective piece, mourning a lost love. Relatively simple, sweet, and a nice ending piece. Overall, Old Dirt Road gives the impression that Lexington Field had fun making this recording. It is rather hard to follow and fully appreciate a lot of it, but there are a few gems. Old Dirt Road doesn't really stand out from the crowd in any particular way, but there are enough details that one should at least hear it through. 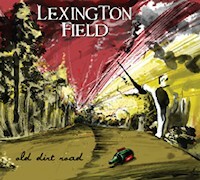 Lexington Field could become a force to reckon with in the future as they find their own sound and their own direction. We wanted to make special mention that this album is dedicated to Laurel Milne who was a special 13 year old girl who lost her battle with brain cancer in the fall of 2010. "A Better Place" was written by the guitar player Brian. The band felt that she was a significant influence because of her strength and fight she put up to cancer during the time period when the album was being written. Laurels Reels is also dedicated to Laurel Milne. Cami, the fiddler, was a a friend of her, since Laurel was Davids daughter and Cami worked in Davids restaurant.